Although the Apple 1, introduced in April 1976, had been a big success among the hobbyist crowd, people who didn’t mind assembling their own computer and designing a case for it, it was not part of the ready-to-go personal computer revolution of the late 1970s. That’s where the Apple II comes in. The Apple II included a logic board, keyboard, and power supply all inside a case, so it was ready to go when you took it out of the box. Thus, when it shipped on June 10, 1977, it was Apple’s first consumer product, competing with the TRS-80 Model I (August 1977) and Commodore PET 2001 (October 1977) later in the year. These three models were the start of the personal computing revolution and sometimes called home computers, but they soon found their way into classrooms and offices. Commodore developed a floppy drive system with 170 KB capacity and built its disk operating system into the drive itself, which has its own 6502 CPU. The TRS-80 was in every on of Radio Shack’s 3,000 stores, had a monitor, included a cassette recorder, and the computer itself was built into the keyboard. With distribution like this and a US$600 price tag, it was a runaway success and outsold all other brands for several years. Expanding the Model I required a $299 Expansion Interface (1978) that adds a printer port, expansion port, two tape drive connectors, a floppy drive controller, signals for a real time clock, and up to 32 KB of additional memory. A serial port was optional, and 85 KB 5-1/4″ floppy drives cost $499 each (you could have up to four, and one came with the Expansion Interface). The Apple II was the only one to support color graphics and connect to a TV using an inexpensive RF modulator, making it possible to avoid the cost of a monitor or use an inexpensive 9″ security monitor with composite video input. It shipped with as little as 4 KB of system memory and can support up to 64 KB. Best of all, it has 8 expansion slots that can be used for parallel or serial cards, a floppy drive controller, a CP/M card, a speech board, or any number of other devices undreamt of in 1977. It could also save and read programs from a standard cassette tape recorder, something most people had access to. The downside was its price tag, which started at US$1,298 – the same amount it would cost to buy both of its competitors. But color was attractive, Apple had a big profit margin, and by marketing to the education market, Apple got a leg up on the competition despite its high retail price. One more problem: The Apple keyboard is upper-case only, even though the computer supports both upper- and lower-case characters. Shift key keyboard mods were quite popular, and some word processing apps developed their own work-around for this issue. What really helped Apple move into the workplace and develop a software market was the 1978 introduction of the Disk II floppy drive and its controller, another clever piece of Steve Wozniak engineering that used a lot less parts than other floppy controllers on the market. Apple was also the first company in the personal computer market with a floppy drive, giving it a great draw for software developers. There was also a more business-oriented alternative to home computers – machines with Intel 8080, Zilog Z80, and Intel 8085 CPUs that used Digital Research CP/M as their operating system. CP/M was available on many brands of hardware – including the Microsoft Z-80 SoftCard for the Apple II – but lack of standard graphics and standard 5-1/4″ disk formats kept these in the workplace instead of the home or classroom. The floppy drive was much faster than cassette tape and more reliable. Disks could initially hold 114 KB of data, and with Apple DOS 3.3 in 1980, that increased to 140 KB. Apple has always been a significant player in personal computing, but it was never the biggest. The Apple II included the Integer BASIC that Wozniak had developed for the Apple 1. Commodore licensed its BASIC from Microsoft, and Radio Shack included TRS-80 Level I BASIC, which was based on Tiny BASIC (Level II BASIC was an extra cost option). 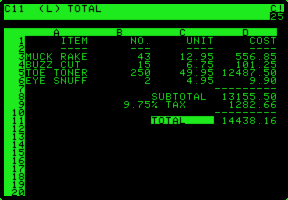 In 1979, the most important piece of software ever written for the Apple II arrived, VisiCalc, the first electronic spreadsheet for a personal computer. All of a sudden, Apple IIs were showing up in the workplace where executives could do their own “what if” calculations instead of waiting for IT to run the numbers. VisiCalc as the first “killer app” in personal computing. How do you improve on such success? By adding Applesoft BASIC (licensed from Microsoft until 1985 for $21,000) and making it easy to have 64 KB of memory installed. The Apple II Plus retailed for $1,195 with 16 KB of system memory when it was introduced in July 1979. On a personal note, this was the first personal computer I ever used. The guy I was working for pretty much said This is the future, let’s figure it out and brought in an Apple II Plus with floppy drives and printer. I was hooked in no time. Apple also made versions of the II Plus for Europe (the Apple II Europlus) and Japan (the Apple II J-Plus), each localized for electrical and video standards of the target market. Apple produced a version of the Apple II Plus for Bell & Howell – a black version aimed at the education market with A/V options. Apple also sold logic boards for the ITT 2020, making it the first licensed Apple clone. The ITT case looked like Apple’s but was either grey or painted silver. The system was redesigned for the European market and had color support on a composite PAL color display, which the Europlus didn’t support. It also supported 360 pixel wide graphics vs. 280 on the Apple version, which made some apps incompatible, and a 220V 50 Hz power supply made by ITT. Sadly, ITT stopped selling this model when Apple introduced the Europlus. The Apple II Plus was discontinued in December 1982 to make way for the Apple IIe, the first Apple computer with a working Shift key. But that’s a story for our next installment.